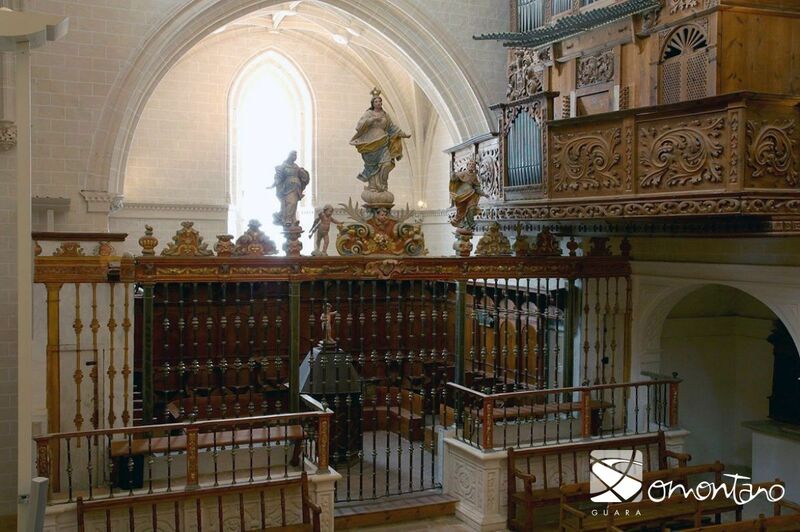 This temple was built to house a community of Augustine canons who established themselves in Alquézar after the reconquest and was consecrated in 1099. 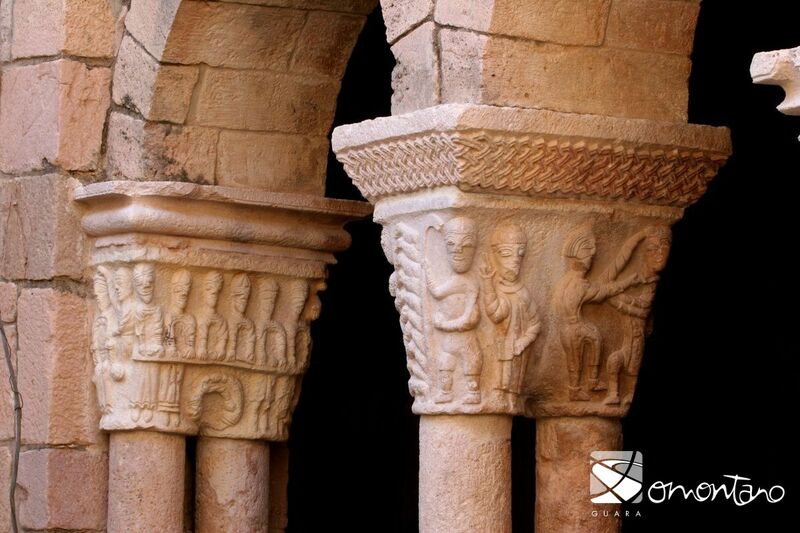 All that remains of the Romanesque construction is the entrance atrium, whose columns boast sculpted capitals. The majority of the reliefs where produced at the end of the 12th century and show scenes from Genesis as well as the major milestones from the history of salvation, Figures depicted include Adam, Noah, Abraham and Isaac, Abel and St John the Baptist, all of these precursors to Christ. In addition to a playing a decorative and narrative role, these capitals evoke theological reflection, which would not be within reach of every mortal, just a handful of privileged people. 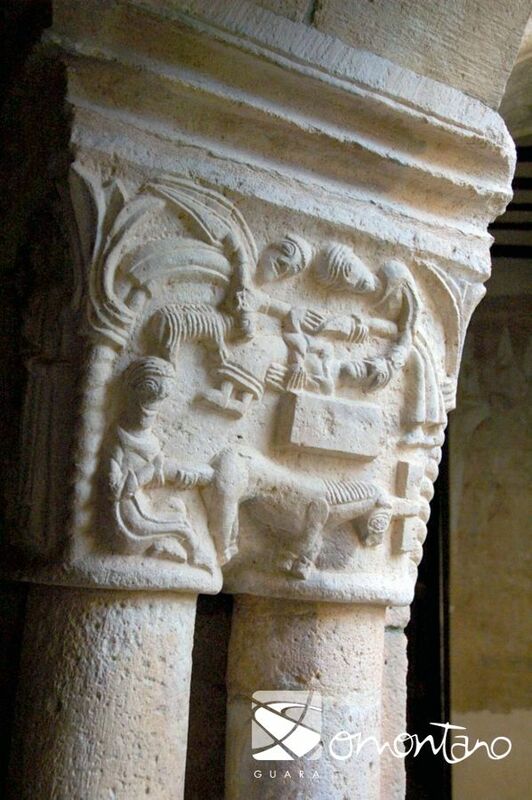 The reliefs of these Romanesque capitals and their hidden message were directed at the canons who lived there, who would meditate on a daily basis in the arcade. They would ponder the moral lessons behind the images and would reflect on the mysteries and dogmas of the church. They are in fact no more than books written in stone with a pedagogical aim. In the 14th century the community of Alquézar decided to construct three walkways to create a cloister, by taking advantage of and integrating the arcades of the old Romanesque atrium. Because of this and due to the lack of suitable space, its form is not square but extremely irregular. In the 15th century the walls of the cloister were painted with murals, which were continually repaired and repainted until the 18th century. 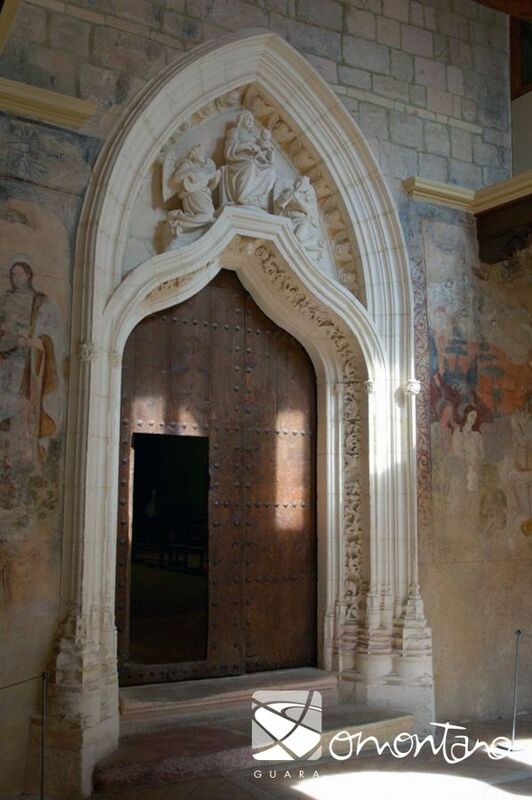 The entrance to the chapel that opens to the cloister is a true reflection of the melting pot of cultures that lived in Somontano in the 16th century, as the decor reveals Gothic, Mudejar and Renaissance elements. 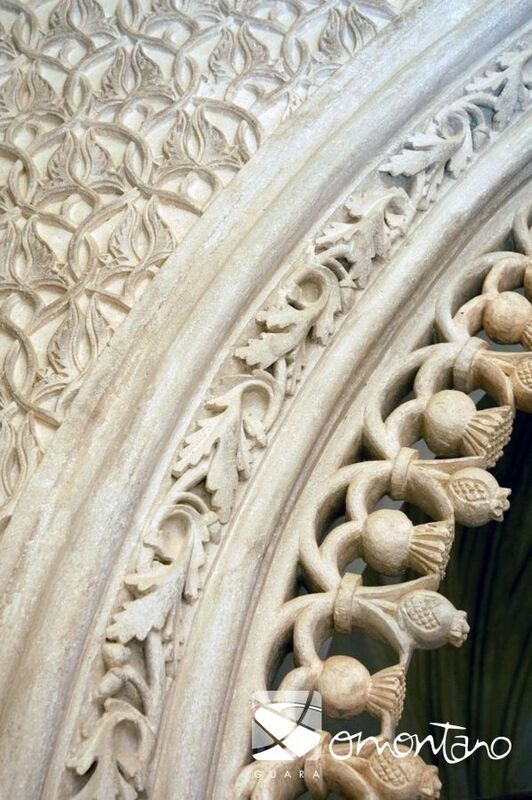 The vegetal decoration showing thistles and leaves is Gothic in origin as is the detailed pattern on the arch’s border made up of a juxtaposition of bows loaded with pomegranates. The facia of the pilasters that border the arches features a number of Romanesque grotesques. Finally, the spandrels boast Mudejar decoration of great finesse with a vegetal theme. An attractive Gothic entrance gives access to the church. This was built around the year 1535 under the tutelage of Joan de Segura, a reliable man with a good reputation as he had already directed work on the cathedral in Barbastro. The church was built with just one nave and a polygonal apse, all covered with star shaped rib vaults. The positioning of the windows high in the walls highlighted their importance and plunged the lower parts of the church into darkness.The main altar completed the décor of the church. It is a fine piece of work carried out in wood with carved images that were painted and gilded. As with all Aragonese altars, this was conceived as a huge tabernacle as the Holy Sacrament was permanently displayed behind the glass of the central oculus behind the altar. Towards 1615 the church was extended with the addition of the Cristo de Lecina chapel, which was Baroque in design. 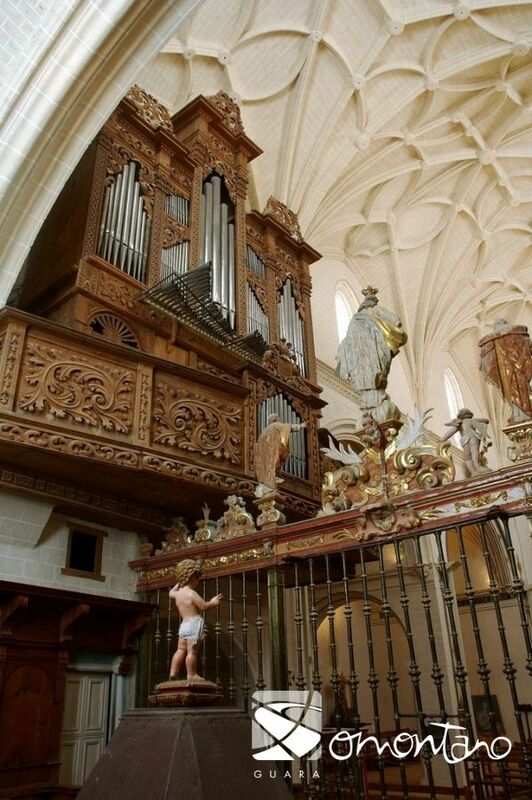 Here, worshipers that had previously prayed at the main altar of the cloister could revere Christ in a dedicated chapel. The splendid sculpture from the end of the 12th century or beginning of the 13th century reflects the Romanesque depiction of the crucifixion. 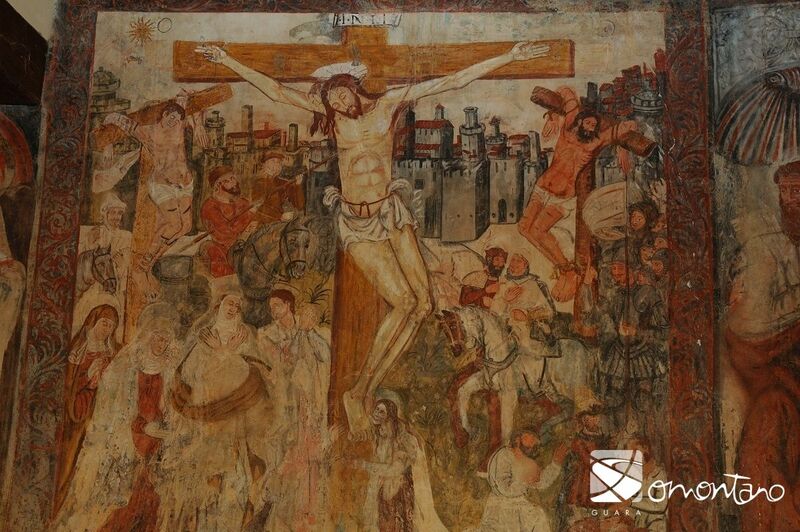 The four nails that attach Jesus’ arms and legs to the cross allow his body to rest and not contort as was the case with the suffering Jesus of the Gothic era. The figure is life size and is represented as dead. In the 16th century the cloister was extended with the addition of a second floor. One of the large rooms that had once served as a bedroom for the canons now serves to display a number of pieces from the church’s past. Info: 974 318 267 o 669 681 044.